Number Pyramid puzzles are a fun puzzle, particularly suitable for children and those looking to improve their mental addition and subtraction skills. 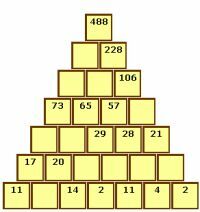 Rather than an abstract set of sums in an exercise book, there is a real sense of satisfaction at completing the number pyramid. The puzzle tests the ability to add and subtract different values and work out how different numbers relate to each other, aided by the visual presentation of the puzzle. All of our number pyramid puzzles have one solution that can be reached without any guessword at all. Easy, medium and hard puzzles are available, which vary the number of pyramid-blocks that must be filled in and the size of the numbers involved in the puzzle to solve. Puzzles are available in a range of formats, standardly PDF or EPS, complete with solution and licensed for publication. Puzzles standardly come in black and white; we can also colour the numbers and pyramid blocks in the puzzle with a colour or colours of your choice if preferred. Sample Number Pyramid PDF.